Ideal for use individually, or in a range of formations to complete your training or meeting room, this Jemini Trapezoidal Table features a sturdy silver frame and stylish beech finish desktop, which is easy to wipe clean. Combine with rectangular and semi-circular Jemini tables to form a configuration that suits you. 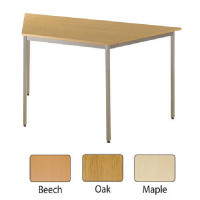 This desk measures W1600xD800xH730mm.